iTestMic2 is the only direct-connect iOS calibrated test & measurement microphone that includes a 3.5mm analog audio output and iOS device charging. Plug it into your iOS device for instant, accurate SPL readings, plug in a 3.5mm (1/8") audio cable to get audio output signals, and plug in the included power adapter for long-term noise studies or just to charge your iOS device. Each iTestMic2 now includes individual frequency calibration files that improve the frequency resolution of the microphone and cancel out any minor capsule deviations. iTestMic2 is the perfect companion for iPhone 7, since it has an audio output and also allows simultaneous device charging. See how to make an affordable and powerful hand-held audio analyzer system based on iTestMic2. Direct-connect, bypasses all Apple analog electronics using a digital audio link and supplies charging power when the included AC adapter is plugged in. A high-resolution analog preamp, regulated low-noise power supply, Analog-Digital Converter (ADC), and Digital-Analog Converter (DAC) are used for precision measurements and audio quality. 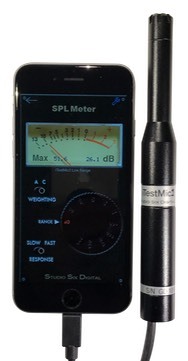 Calibration is stored in the microphone for instant accurate SPL readings. Just plug iTestMic2 into your iOS device, launch AudioTools or another Studio Six Digital audio test app, and the calibration is automatically transferred to the app for accurate SPL readings. Since we use a regulated internal power supply, calibration will not change with varying iOS device voltage. No user calibration is required. At any time, you may use a standard 1/2" nominal calibrator and check or adjust the calibration. Every iTestMic2 is hand-calibrated during production at our US facility, comparing it to our Class 1 iPrecisionMic. The frequency calibration files are then downloaded directly into the app from our server. iTestMic2 includes a 3.5mm stereo analog audio output jack for test signals as well as general purpose audio output. Note that this is a full-level output and does not respond to iOS level controls. Also on the bottom of the microphone is a 1.3mm 5.0VDC power jack input for iOS device charging. A universal voltage AC power adapter is included. The 1/2" nominal diameter microphone has been designed to minimize high-frequency diffraction effects for the flattest frequency response. iTestMic2 has 2 gain ranges to support a wide 25-120dBA SPL range. 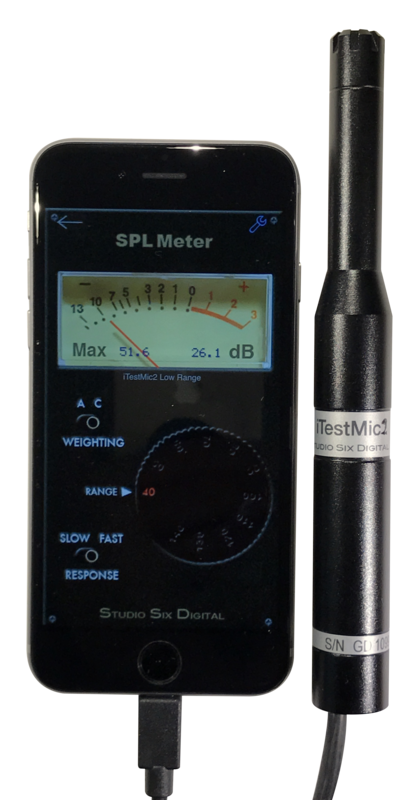 The microphone capsule and electronics provide an extremely flat response,with low frequency response to 10Hz for accurate measurements below the audible audio range. iTestMic2 has many uses, since it transforms any compatible iOS device into a professional sound level meter and sound analysis system.